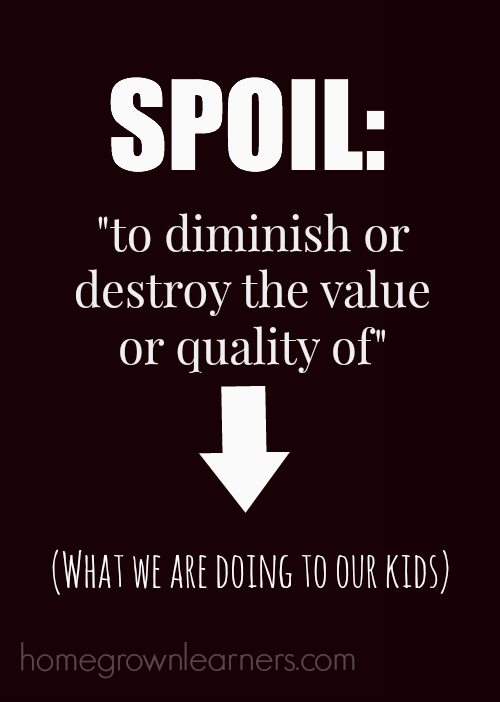 It's time to stop spoiling our children. Parents have abdicated their instinctual jobs as parents in favor of letting the CULTURE raise their children. Children spend more waking hours with peers than they do with parents. How in the world do we expect peers to raise peers? The parent/child relationship carries less and less meaning as each generation unfolds, and I believe the results are disastrous. At no other time, however, have children had so MUCH. What our children NEED is more of their parents, and less STUFF! As a consequence of all this STUFF, children are dependent for longer, have much less concern for others, and are losing that feeling of accomplishment that comes from plain old HARD WORK. Sometimes it feels like my family swims upstream - battling against the current of pop culture and society. We homeschool, take part in fewer activities, and often say NO to extracurriculars. We're holding onto our kids (knowing that hopefully holding onto them in the early years will create children who are MORE independent at an earlier age)! This model of child rearing isn't always popular, but I'm not out to win a popularity contest. 1. Give them responsibility. Children need to be responsible for the running of a household. Make them cook, clean, do the laundry, cut the grass, and anything else you can think of. 2. Stop affording them every opportunity. Your children don't need every sports activity, music group, or social opportunity. Sometimes in efforts to help our children discover their "talents" we forget to place family time and service to others first. 3. Encourage humbleness. In a culture that celebrates winning and individual achievement, teach your children to recognize and celebrate the accomplishments of others. Our children also need to learn to give GOD credit before themselves. 4. Give them opportunities for service IN LIEU OF activities for themselves. "Community service hours" are in vogue now. What a sad concept. When we have to require our children to serve the mentality is that it's another "box to be checked" on a transcript. Provide meaningful service opportunities for your children and don't count the hours. Serve to serve. 5. Don't let them take part in social networks. Social media focuses kids INWARD and also breeds comparison. 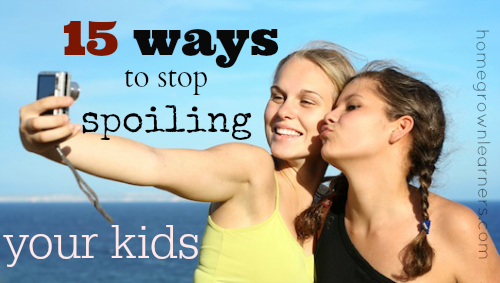 We've said no to social media for our kids and I do not regret the decision. 6. Give them your TIME. It's easy to give your child THINGS. In the end, however, they really want your TIME. The parent/child attachment is the most important relationship for our children. Most children see their peers more than their parents - which leads to unhealthy peer attachment. Never before in our history has peer pressure and influence been so pronounced, and it's NOT OK.
7. Stop doing things for them. If your children are capable of doing something themselves, expect they should always do that. It's ok to serve your children every now and then, but consistently being a servant to them enables a child to be spoiled and lazy. 8. Be generous - REALLY generous. Do your children witness YOU giving sacrificially (not just giving the "extras") to people in need? Are your children forced to give up something they really love to help someone else? Do you talk with your children about tithing? 9. Let them be bored. The gift of boredom is a beautiful thing. Boredom inspires great creativity and teaches our children that life isn't always exciting. 11. Tell them NO (even when it's hard on YOU). If your child wants to do a particular activity but you feel it will cut into your family time, say NO. You have authority over your child and know what is best. If your child wants to play video games but you know they really shouldn't spend their time in that way (although it would make for a quiet afternoon for you). Kids need limits and need to know their every wish will not always be granted. 12. Give them the courage to be DIFFERENT. Just because everyone else is doing it doesn't mean we have to. Model for your children that being different is wonderful! We don't all have to make the same educational choices, listen to the same music, or do the same things in our free time. 13. Don't give them Christmas presents. Really, I'm not joking (we did this four years ago and it was our best Christmas ever - now we limit to three small gifts). Take that money and shop with your children for presents for a child that REALLY NEEDS THEM. Donate to an orphanage. Pack as many Operation Christmas Child boxes as you possibly can. Once Christmas is over our own children will probably never miss the presents, but the gifts to a child in need go appreciated for a huge amount of time. 14. Show them poverty up close and personal. Let your children go on a mission trip. Serve with them in a homeless shelter (remember - don't do it for the "community service" hours). Go to an impoverished area and pass out Manna Bags. It's not good enough to just give money to these causes, our children need to meet people that have dire, immediate needs. 15. Don't give them an allowance. Kids need to work around the house just because it's their responsibility as a member of a family. My kids can do above and beyond jobs for me and I will attach a monetary amount to them. My daughter only has money to spend if she has earned it that way or through babysitting. Do you think kids today are spoiled? Would you add anything else to this list?